Weddings can be expensive occasions and costs can quickly add up. But there are things you can do to prepare financially for your big day. Check out our A-Z on how you can do just that and still enjoy the perfect wedding day. The latest research shows that the average total budget for a wedding in Ireland in 2016 is €22,531, up 6% on 2015. On top of that, 38% of couples end up spending more than their planned budget. With costs rising, it's more important than ever to make savings wherever you can when planning your big day. Planning your budget is critical. Decide on the maximum amount you are willing to spend on your wedding and each of you decide on your top three priorities, whether it's the band, the dress or the rings. You can agree to spend a little bit more on these items and cut back elsewhere. On average, Irish couples spend upwards of €300 on a wedding cake, which often goes unnoticed by most guests. You can make an easy saving here and decide to go without the cake. Alternatively, there's the option to take a trip to Marks & Spencer in Newry and pick up a three-tier wedding cake from as little as £60 (not available in Republic of Ireland). Buffet style eating at a wedding is often a much cheaper option than the traditional four or five course meal. It comes with other benefits aside from the price such as giving guests the opportunity to move around and chat to different people and providing more options for people with special dietary requirements. Longer engagements can be great for keeping costs down as you bide your time and don't get caught making panic purchases. Make use of the expertise of family and friends. Perhaps your sister has a flair for the creative and could help with the decor or your dad knows a guy with a vintage car ready for a special outing. While it's great to have family and friends involved, groomsmen and bridesmaids are a big expense once dresses, suits and flowers are divvied out. There is no rule stating you must have equal numbers of groomsmen to bridesmaids so don't feel you need to take the costly step of adding more of one or the other just for the sake of evening up the numbers. An oldie but a goodie: don't forget to tell everyone you can that you're on your honeymoon! You'd be surprised at the upgrades and complimentary tokens of well wishes this will return. If DIY invitations seems like a job too many, just consider the fact that wedding invitations can cost more than €300. If you're looking for a head start, congratulations.ie stock a range of DIY wedding invitation supplies. With the impressive quality of costume jewellery these days, there's no need to splash out on expensive wedding day jewellery if you're on a tight budget. Whether you decide to invite children or not is completely your choice but don't be afraid to make yours an adults-only wedding if that's your wish. You'll make some savings, plus you might be surprised at how many parents will be glad for an excuse for a night out and arranging a babysitter. Bridal-specific underwear is expensive, so make sure to check out places like Debenhams and Marks & Spencer first who also have a wide range of suitable bridal options. The most popular months for Irish weddings are July (15.7%), September (11.9%) and August (11.6%). 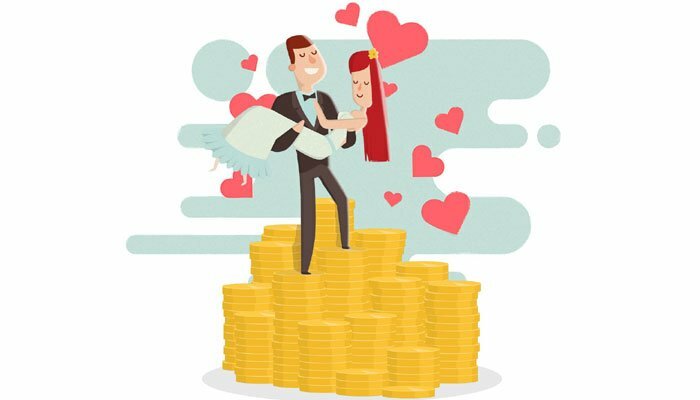 As you would expect, these are also the most expensive months to get married. February is thought to be the cheapest month to get married so it might be worth exploring your options for this time of year and give your friends and family something to look forward to in the winter. When searching for suppliers, be mindful of going straight to wedding specialists. Using the word 'wedding' or 'bridal' has a knack of immediately upping the price of goods and services. Whether it's speaking to your local bakery about your cake or a hair stylist about formal up-dos, think about what suppliers you can talk to before bringing up the 'W' word. When you've identified a supplier that you're interested in, it can be a good idea to sign up to their mailing list. That way you can wait for and pounce on any special offers as soon as they become available. We mentioned decor and invitations as possible DIY projects and that's just the beginning of it. Take some time to browse Pinterest for endless DIY wedding inspiration and see where you could make some savings while also putting your own unique stamp on the day. Whether it's the venue, the meal, the bar extension or the band, always be prepared to negotiate on costs. The savings could be significant. Twice as many men lose their wedding ring as women! Perhaps this is an item the groom is happy to do on the cheap. Sending elaborate 'Save the Date' cards in advance of wedding invitations is a relatively new trend that has made its way from the U.S. and into the Irish wedding. While it is sensible to give your guests plenty of notice once you've decided on your date, a simple email or phone call is a perfectly acceptable way to deliver the message while saving on stationery and postage. Consider starting your wedding a bit later in the day. By moving your ceremony to 5 or 6 pm followed by dinner you'll cut out expenses such as reception drinks, canapes, reception music and perhaps even the band moving straight into the DJ entertainment. You may even justify a less costly mid-week date as people can arrive after work and perhaps only take the following day off. Similar to 'Save the Date' cards, wedding favours are also a relatively new addition to the Irish wedding and if you're on a tight budget, can be firmly placed on the 'Unnecessary' list. Be on the look out for great value on items such as bridesmaid dresses and shoes around big shopping events such as the January sales and Black Friday. For many women, this will be high on the list of priorities, however on average it'll set you back €1,622. If the dress isn't the be-all and end-all, you do have other options. There are now numerous boutiques that offer the option of renting your wedding dress for the big day. This could mean that the bride can wear the gown of her dreams for a fraction of the price. Charity shops are another great option. Stores such as Barnardos have their own dedicated bridal rooms stocking brand new wedding dresses donated by well-known Irish retailers, wholesalers and designers from as little as €250. Ok, we admit it, we're struggling here! But, still a xylophone wedding march would certainly give your wedding that little bit of x-factor wouldn't it? As you can see from this list, there's very much a trend towards doing your day your way, especially if there's cost savings involved. Don't be a slave to costly traditions, design your day your way and you'll open yourself up to a wide range of savings. Weddings can be expensive occasions and costs can quickly add up. But there are things you can do to prepare financially for your big day. Our budget calculator will help you get to grips with your monthly income and expenses and will help you see where savings can be made. Our budget spreadsheet will help you plan and manage your money more effectively.